Spring in Japan is a time to celebrate blossoming peaches, plums, cherries, and … women. Hinamatsuri (Doll’s Festival, or Girl’s Day) is the annual shout-out to the daughters of Japan, where every March 3, families pray for the health and happiness for the young ladies of their houses. The custom dates back to the Edo Period. However, its origins date back even earlier to the Nara period celebrations of sekku (seasonal festivals) that take place on auspicious odd dates. The March 3 date was originally a celebration of the peach blossom, hence the day’s other alias of Momo no Sekku (Peach Festival). At the ritualistic center of Hinamatsuri is the erection of a hina-dan, an elaborate tiered platform draped in a scarlet carpet and adorned with hina-ningyō (hina dolls) dressed to depict a Heian-era Imperial court. This elaborate dollhouse is thought to derive from the ancient custom of hina-nagashi (doll floating), a purification practice in which misfortunes are transferred to a doll and set afloat down a river, supposedly taking troubles and bad spirits with them. At the feasting center of the day is an assortment of offerings in pastel colors, and heavy in symbolism on the general themes of fertility, relationships, and health. In the weeks leading up to the day, these themes begin to appear in department stores, supermarkets, and convenience stores flanked by hina doll displays and peach blossom branches. Mochi cakes in the shape of a diamond are thought be an Edo-period symbol of fertility. 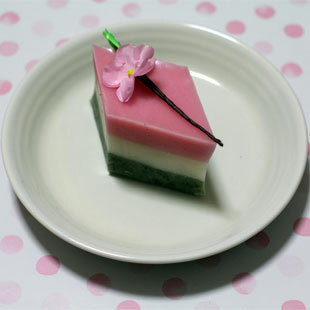 These are made up of layers of green, white, and pink mochi. Green is said to represent fresh grass and symbolize spring and new life; white represents snow and purity; and pink, peach blossoms and good health. The green is traditionally made from mugwort, which is believed to improve the blood; white from water caltrop, which is thought to lower blood pressure; and pink, made from jasmine, which has a detoxing effect. 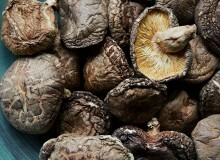 In some regions, there’s another layer of yellow, which represents spring’s flowering nanohana plant. 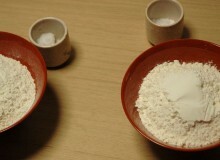 Arare (hailstones) are a type of senbei, traditional rice crackers eaten for over a 1,000 years in Japan. Where senbei are larger rice crackers, arare are small, and come in an array of sizes, flavors, and shapes. 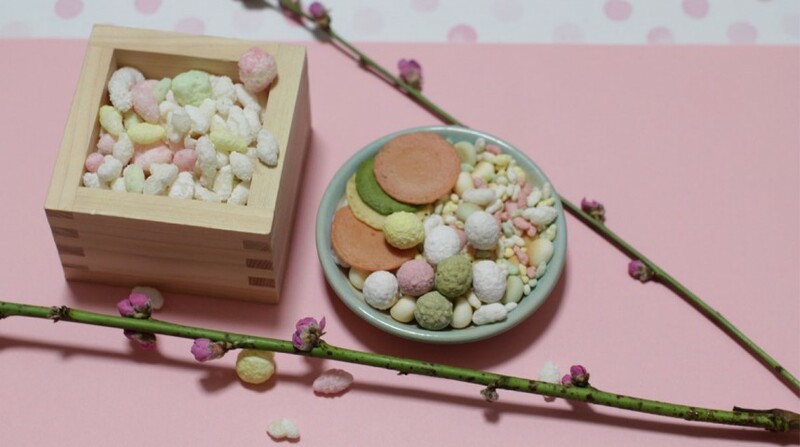 Hina-arare are sweetened and colored in the characteristic Hinamatsuri pastel palettes of green, yellow, pink, and white. These kari-kari (crispy), bite-size snacks, which look like something a doll might eat, are only available from January to March, for Girl’s Day. 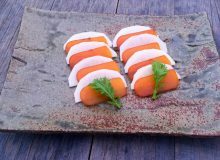 These plump, pink rice cakes are filled with anko (sweet red bean paste) and are encased by a sakura leaf pickled in salt. The mix of the chewy exterior and creamy interior, and the sweet and earthy flavors of anko and the salty leaf, is pretty remarkable. Definitely worth sampling even if you’re not a Japanese daughter. “Scattered” sushi is an elegant dish of rice decorated with an array of ingredients, such as sashimi, crab, ikura (salmon roe), and tamagoyaki (omelette). Some popular toppings include prawn, for longevity; lotus root, for good prospects; and beans, for faithfulness. “Hand balls” were traditionally fabric and embroidered balls made for games. They’re also small, ball-shaped sushi that are easy to make and can be prepared with colorful toppings. 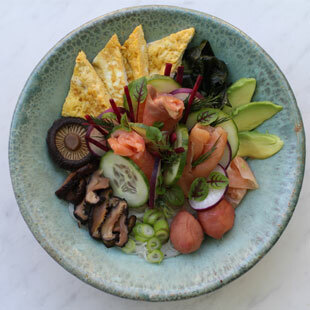 For Hinamatsuri, they’re often topped with green, pink, white, and yellow ingredients, such as shiso leaf, smoked salmon, squid, and omelette. Clam shells, which fit snugly together, are said to symbolize a united and happy couple. A popular clam dish for Hinamatsuri is ushiojiru, a salty and clear soup with clams as the main ingredient. More notable mentions go to other candies, jellies, and sweets in shades of pink, white, green, and yellow. These include rakugan (hard candies) and ichigo daifuku (strawberry- and anko-filled rice cakes). Together, this fanciful sweet and salty banquet is typically washed down with cups of thick and sweet shirozake or amazake, both low-alcohol or nonalcoholic fermented rice drinks.